This is an interesting piece based on one in the Met Museum. They have logged it as French late 15thC, not wanting to get caught out twice in a week, I have to say I think that this is more likely German early 16thC, but please let me know your thoughts. 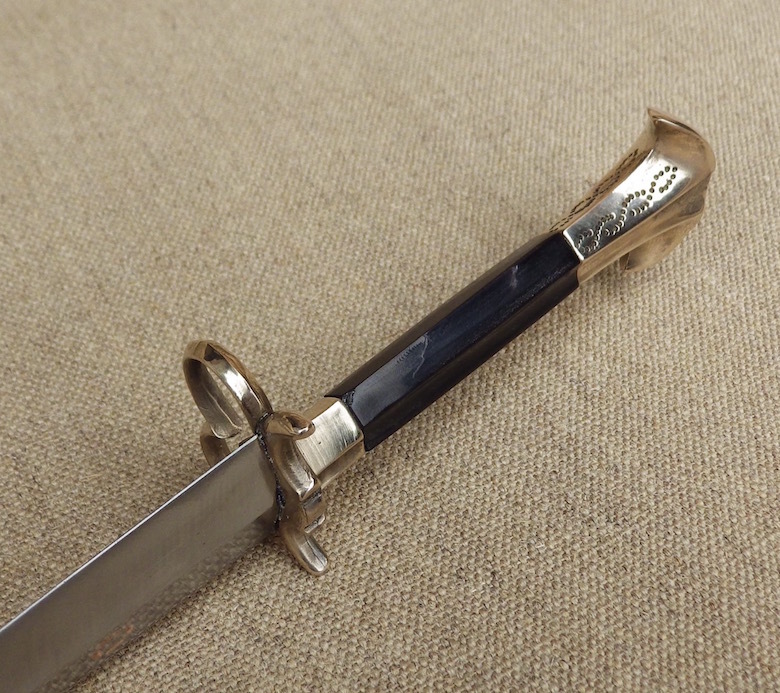 A lovely and delicate example of a half guard dagger that were certainly popular with the Landsknechts. The pommel is engraved with a series of dots in waves, with a central fuller going through the horn handle and into the guard. The guard itself is fully formed as two intersecting circles on one side and only the 'stubs' of the guard on the other. 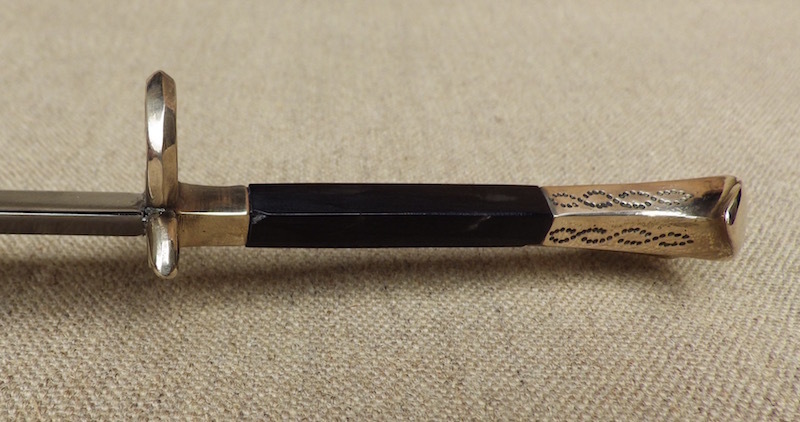 The grip is made from bronze and horn. 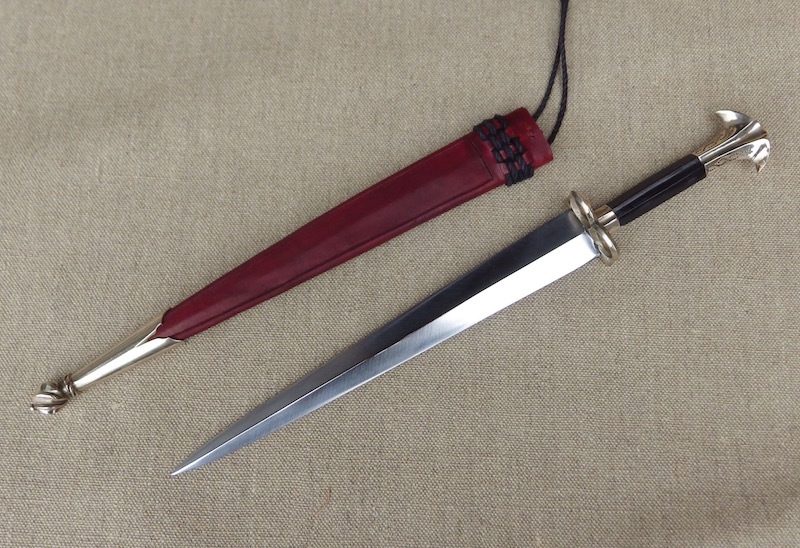 The blade is a strong double sided diamond at 10" long with an inlaid mark in copper. 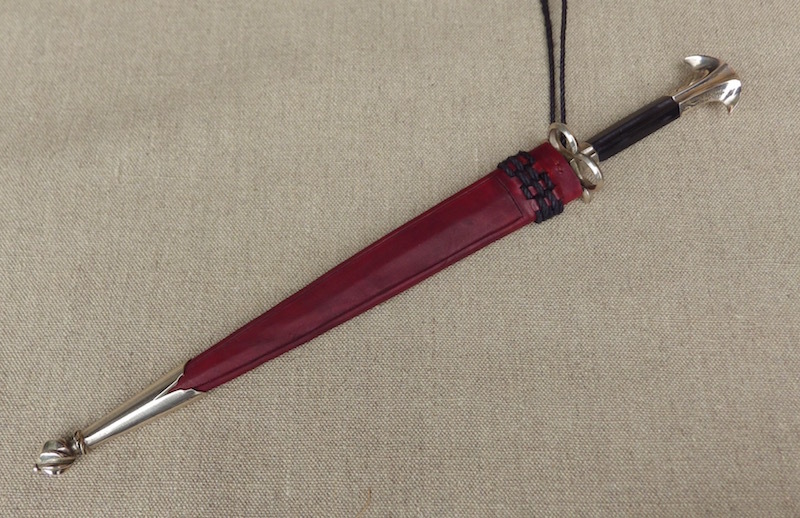 The sheath is in a red veg tan leather with hemp cords and a bronze chape. A fine piece! 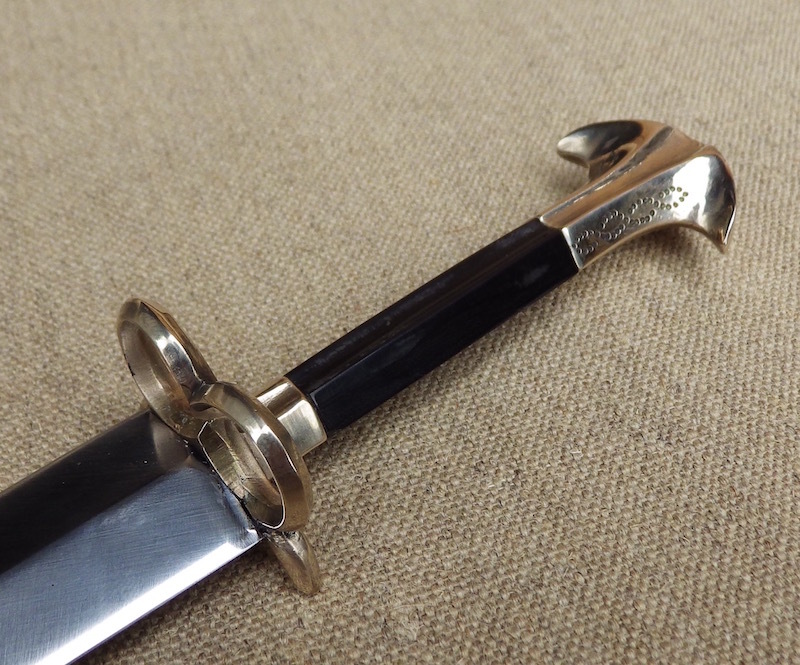 I don't think I've ever seen a pommel like that before on a dagger, but it certainly reminds me of fish tail pommels on 15th century swords. Wow Tod, that looks great! Elegant and functional all at once. Do you have pictures that you are allowed to post of the original? P.S.--I really like your eye for color combinations with your daggers+scabbards and your crossbows. Always a good pairing. Love the original at the Met and I really like your interpretation. That would look great in my collection. Great work, Tod. Are the guard/pommel made of cast brass? 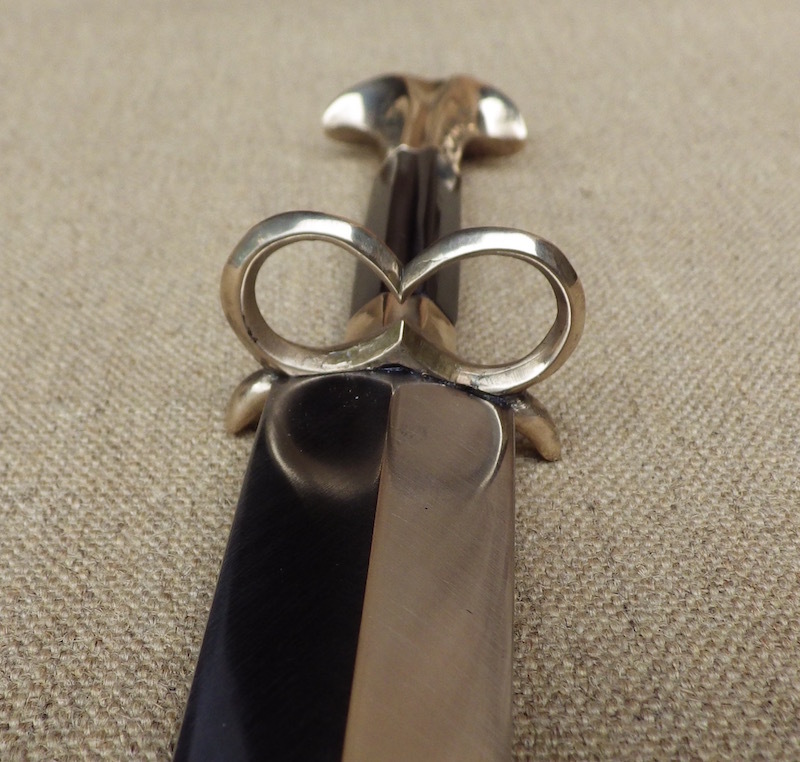 Craig - I have not seen a dagger pommel like this either, but the shape is reasonably similar to other Landsknecht dagger pommels and very similar to some Katzbalger pommels. Alex - Thanks. My version uses cast bronze as did the original and I modelled it in wax as did the original, but my finishing would be less from that point, but actually this one is not too hard to to get the files into. just curious how you found out that the furniture on the original dagger is cast bronze? 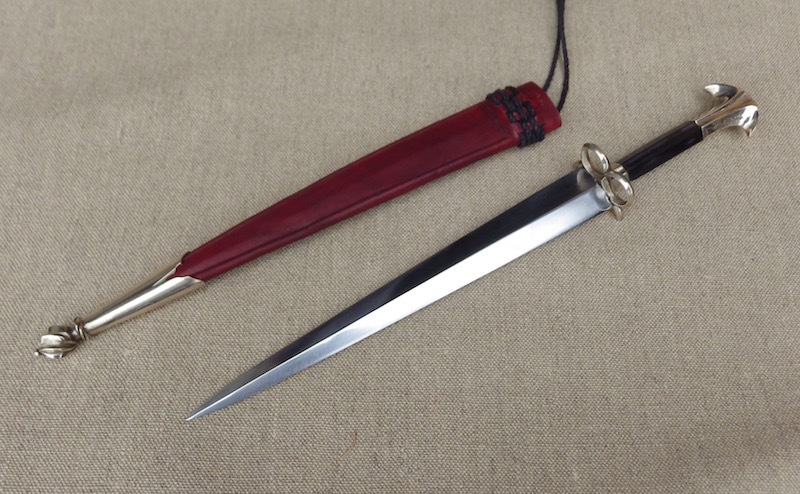 I don't see this dagger published in the Dean's book, it is published in Tarassuk's paper on parrying daggers but alas without mentioning handle materials. I saw it many times at the Met and had an impression the pommel/guard were the color of old iron. Will take a closer look when at the Met next time. 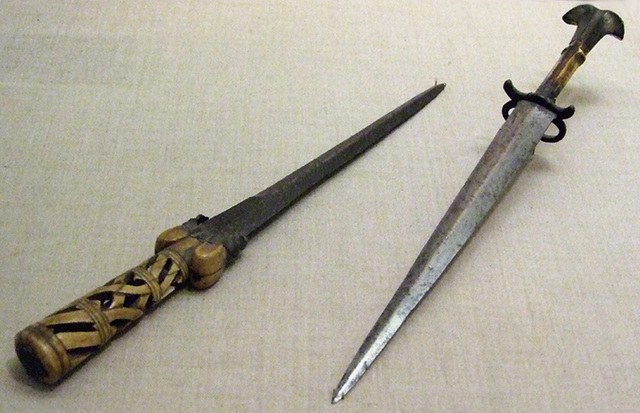 The Met page I listed says the dagger is bone, bronze and iron, but I have never seen it in the flesh. Been to the Met last weekend and took a good close look at the dagger, as close as the glass allowed anyway. Yes, pommel/guard really are cast in bronze. But the patina is so dark, almost black, that I always before assumed it was steel. Maybe the bronze was of some unusual composition? Lovely as always. I enjoy your daggers and side arms!